I saw this at Raffles City Shopping Centre. It's part of the Singapore Art Show. 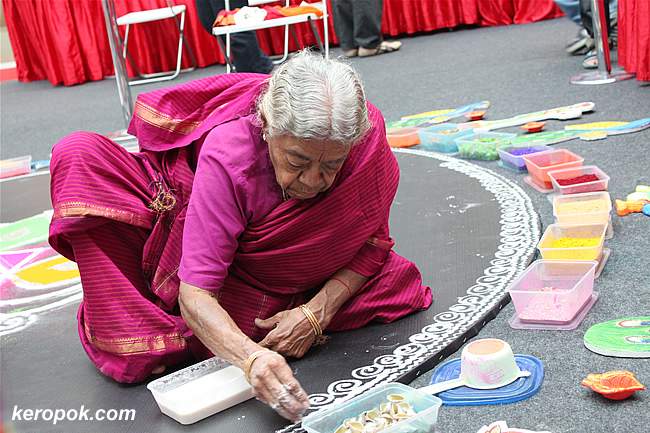 Two ladies were putting up a Rangoli - sandpainting. You can see this in many Indian (Hindu) houses especially during Deepavali. Hi, I'm shi yu. I'm currently working on a magazine for my club and hope to use some of the pictures from your blog. Would like to seek your approval for it, please contact me @ watever_181@hotmail.com I'll explain more to you from there. Hope to hear from you soon. wow, excellent vivid sari colors of the lady doing the sandpaint. i was in Sing.. should hv checked out the ArtShow. Too bad all my colleagues told me about was the IT fair at Suntec. It was rice flour mixed with water for the design she was doing. The rest are like coloured macaronis! there was different sort of pasta too! also coloured rice! pretty! There are the great 4 IT shows a year in Singapore. Guess what? I did not walked into the IT show this time at all! Hmmm what about doing a search on wikipedia?